As the management team, we are always focused on promoting the most positive environment here at Provident Crossings. We value all of the outside services our Residents can utilize in order to live the most vital and rewarding life. Our focus, however, is on serving our amazing residents and protecting their environment by "managing" outside services in the manner of protecting privacy, upholding security and promoting a professional etiquette at all times. We live by example in our Community by always conducting ourselves in the vein of service and expecting all outside vendors and team members to do the same. We are in the service industry and we look at the opportunity to serve as a responsibility to always give 100%. In the last year as leaders of a fantastic staff, we have had the wonderful opportunity of working with fabulous care providers that offer an amazing array of services. These caregivers are managed by outside teams that value the sanctity of our private residence and have given our residents an opportunity to enjoy their active independence. We are here to serve these professional caregivers as well as our residents and welcome the opportunity. I recently visited Provident, looking to downsize from a home to something smaller. I was VERY impressed with both the tour I received AND the facility itself. Clean, neat, uncluttered, lots of daytime amenities and fun and games. The apartments seemed to have everything one would need. CAUTION, THOUGH: I'm still working part-time and eat lunch out some days plus regular dinners with friends. Provident's food service looked exceptional, but I feared I'd be paying for a lot more food than I'd consume. Plus the cost was a little more than I can handle right now. (Breaking news: These places are expensive!) However, if you want complete pampering and can afford it, this would certainly be a good choice. I might reconsider down the road. I've been living here at Provident Crossing a little under a year and I really like it. The program is right for me. I like the people, but they admit too many people who are closer to assisted living. There are too many who should be either a few mentally past living this way or physically should be somewhere else for more help or assistance. As you line up all the walkers in the dining room, it just looks bad and that's a turnoff to me. I have friends there who are in their 80s and 90s and are still active and still mentally quite capable. The food and program are good, the rooms are nice, and I'm very happy with the staff here. We have a turnover particularly in the dining room because they have lots of college students who work and they work by semester, but they seem to be well trained and they look after us. Our concierge is good. We recently had a manager change with a new one and they have done a lot to improve and maintain a good program. I'm happy with them. I can always find something to eat. People complain, but there's enough to choose from, and you can always make a nice meal for yourself. Everything that they say that they have is here. I still have my car. Some of them complain a little bit about not having enough variety in the provided transportation, that is going to the doctors' appointments, the grocery, and those sorts of things. They would like to have more. There are card games, dominos, and baseball. They have a full calendar of activities. If you're bored here, that's your own fault. I didn't find any place else that was cheaper and even if it was the same price, the square footage would be less or they had things I didn't like, like rather than having cabinets, they have open shelving. I found Provident Crossings for my mother. She would be trying it out for three months because she’s not ready to move in permanently yet. We would see by the end of the year if she would want to permanently move in. Everything in Provident was fabulous. My mom needed certain things, and they were willing to work with us. The room was wonderful. It was very nice. The people were very friendly, and very helpful. I had a visit at Provident Crossings Retirement. I liked the way it was set up, but to me, it had a hotel-like feeling. They mentioned that they have a bus that takes the residents to mall and have movie nights and other things. Provident Crossings was a resort type living. It seemed very well maintained. It did have a really nice dining area. The people that I talked to seemed like they wanted to be there. It was very airy and cheerful looking. On the inside, they set it up like a cruise ship. It was very nice. They have actual kitchen and they have granite countertops. It was first-class. Provident Crossing is probably one of my favorite ones. Whenever they move somebody out, they put brand-new rugs or carpeting in and repaint the room, so it's really nice. It's really a fine place. I went to lunch over there two or three different times, and I really liked it. Our visit at Provident Crossing was a very good experience, but it just wasn't everything that my father-in-law's cousin needed. It was like a cruise ship. It was terrific. It was beautiful. They had big apartments. It was less expensive, but it was independent living, and she needed more than independent living. The staff was very nice and very friendly. They had a nice dining area. The way it was set up was very nice. They had an area that was only for evening dining, where they would be served at their tables. Part of it was set up like buffet style, which they could go for breakfast, lunch, or dinner. They had a nice snack area, so if they missed their lunch or something, or they needed a little something in the afternoon, they had pre-prepared sandwiches that they could go in. We were interested in Provident Crossings because it was close to where my home is, and it was really close to everything that my mom normally does on a routine basis. When we toured it, the things that caught us by surprise were, first of all, it was very costly -- much more costly than any of the other places that we looked at. The other thing was that the amenities that were included in the other places were additional fees here. Like, if she wanted to participate in the group exercise, there was an additional monthly fee. If she wanted to participate in their walking club, there was an additional fee to participate in that club whereas in the other facilities that we visited and talked with had similar groups, but it was all part of their monthly rent. The staff was helpful, knowledgeable, and pleasant. I didn't see them interacting with the residents very much, which was kind of strange. I did see a lot of the residents out in the community areas, but I didn't see the staff interacting with them. They had two types of dining. They had what they call the snack bar or grab and go area, where you could come and get a sandwich or some kind of a snack type food and take it back to your apartment any time, and then they had a cold snack bar area that was open during their scheduled meal times, where they had like a nice salad bar and cold sandwich with cold cuts and things like that, and where you could make yourself a salad plate, that had just open seating. The back part of the feeding area was more like restaurant seating, and you would actually have a menu that was prepared by the kitchen staff. The apartments were very large. Even their one-bedroom apartments were very roomy, very plush, and very nice. But again, their rent was almost two times more than anybody else's. Provident Crossing has a very lovely atmosphere. They have a variety of activities, and the residents are very well cared for. They promote it as a resort style, and it definitely was that with the activities, the dining room, and the lounge area. It is a very attractive place. The water feature when you go in is very nice. The apartment I thought is well laid out. It is spacious for its small size but very nice. The food appears to be outstanding. I didn't eat there, but I know they take a lot of pride in the variety and quality of their food. I like the overall environment and appearance of the community. I visited Provident Crossing. It was a very nice place. It was very lovely. It was the best of all of the facilities I've been to, and that's where I will go. The apartments were beautiful. They were spacious and clean. They were just lovely. They have every activities you can ask for. They would take them to the doctors and to shopping. They have all kinds of games and entertainment. You have everything you wanted. It was a lovely place. It was like being on a cruise. It seemed very quite secure. They had someone always at the front, so I felt it was secure. A dear friend has been living at Provident Crossing for a few years and loved it. She has been told she is being evicted because she signed a complaint about the food. She says they are serving low protein food and food not suitable for diabetics. Lots of beans, rice & corn. She is a dear and gentle person and does not deserve this treatment. Provident is close to home and it’s a very nice environment. The staff is all friendly and helpful towards the residents. They have a lot of activities for the residents like a fitness room, so they have exercise classes, a movie theater, and they have a bus for the residents where they can take them shopping and day trips to different places. The community has one, two, and three bedroom apartments and they provide new appliances like a refrigerator, a stove, a dishwasher and a microwave. The apartments at Provident Crossing were bigger than any of the other five places that I went to within Austin and it has full amenities. It doesn't have a pool, but they have three meals a day included in the price. They also have a chef's pantry which is open round the clock for snacks and sandwiches or anything that they want in the middle of the night. It is a newer building -- only three years old -- and the prices were very reasonable. They do offer outings on Mondays, Wednesdays, and Fridays; so that is three times a week. They also have a lady that the residents can contract either for the day or for the hour, or for a day trip if they would like at very, very reasonable prices. They were charging like $2.50 to help them get down to dinner or lunch. They all have life alert available to them and it is either on the neck or on the wrist, so that way if they fall in the bathroom they don't have to reach for the phone because they can use the life alert to call them. It seemed like a really nice place so far. My parents haven't moved in yet, but they offered them a three day and two night stay, which they did and they loved it. The food was good and they thoroughly enjoyed it. Mom is in Provident Crossing. This is an independent place, and we like that it is bright. The food looks good and they have access to snacks as well. In their dining hall and interior hallways, there is a big kind of skylight in that area. We like that is more open and it has a light feel to it. The residents seem very friendly. The staff seems very good. However, they are a newer facility, so I think they are understaffed sometimes. So sometimes you have to wait a little bit, but they are always very accommodating. I think they need to improve on their staffing level. Mom has a one-bedroom apartment. It is a very open living space with a kitchen tucked in the corner. The bedroom is very large, and it has a huge walk-in closet. She has a full clean bed, six foot dresser, and TV stand in her room. The bathroom is a full bathroom with a walk-in shower that has a bench built into it. There is a washer and dryer connection in the bathroom as well. She was able to bring her full size washer and dryer from home. They have a movie theater where they see movies, and I know that she enjoys seeing movies with other people. There are a couple different game ranges that they have set up, and they are involved in playing games with people. They also have a pool table up on the third floor, so she enjoys taking her grandkids up there and playing pool. It has been good. Provident Crossing was a nice place. The dining area was very nice, and the food was good. The buildings were new, multiple stories, about a year and a half old, and very nice. They have spacious grounds. They play music, and they have a happy hour. We liked Provident Crossings very much. It was a new building and everything was clean. All of the finishes were nice. The lady that we met was very nice, knowledgeable, patient and gave us information. We had lunch with the couple who lived there and they seemed happy. The lunch was good. While, we were eating, a man in a powered chair came and we visited with him. Also, a lady whom we didn't know she lived there but who happened to go to our church and she liked Provident very much. I thought it was nice that people who were strangers came to welcome us. It seemed that people were comfortable and pleased there. We looked at a two-bedroom unit. We liked the fact that there were washer and driers in the bathroom instead of having to go down to a common room for washing and drying clothes. I would definitely recommend it. Beautiful facility. Great location near shopping & soon to be Scott & White clinic. Excellent floor plans, quality finishes & full equipped kitchen. Accessible transportation van. Very nice residents. My sister lived at Provident Crossings. The place was well-kept and had very nice amenities. The food was very good. The apartment was cleaned once a week and if she needed anything, it was attended to immediately. Describe the overall population of independent living residents at Provident Crossings Retirement Resort. What is their average age? What are their favorite things to do? Provident Crossings residents are well-rounded individuals aged 55 and over who live life at their own pace. Some continue to refine a lifelong hobby, or work, while others delight in learning new activities and skills. Positioned at the highest point in Williamson County, Provident Crossings residents get a breathtaking upper floor view or Round Rock, one of the fastest growing and best-managed cities in Texas. Our residents have easy access to all the culture, dining and entertainment of nearby Austin, making our location ideal. What are some recent off-site events that the community activity director at Provident Crossings Retirement Resort has organized? Our full-time lifestyle director collaborates with residents to develop a wide variety of events and activities tailored to the interests of the community. Dinner outings as well as trips to the local farmers market and shopping centers are often found on the weekly agenda. What transportation services does Provident Crossings Retirement Resort offer to independent living residents? 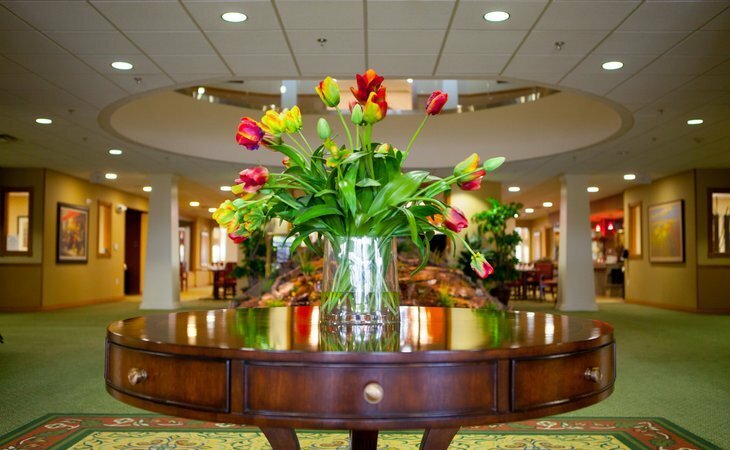 Provident Crossings offers scheduled transportation to professional appointments and group outings, we also offer valet parking for our residents. What makes the chef or dining program at Provident Crossings Retirement Resort exceptional? What kind of menu can independent living residents expect? Freedom Dining is Provident Crossing's most popular feature. The program includes flexible dining hours throughout the day, plus the option to choose from a variety of dining experiences: fine dining, causal buffet dining including pizza, salads, sandwiches; on-the-go snacks; room service is also available as an option, at no additional charge. Our Freedom Dining program ensures residents have ample time to dine, plus plenty of nutritionally-balanced meal options, prepared by our Executive Chef daily. We have a fabulous 150 seat theatre to host live performances, meetings, and of course a great place to take in a movie. Other areas of the community to enjoy include the 24 hour fitness center, library, billiards room and computer center. There is also a gift shop/pharmacy, salon/barber and a bank/credit union located on the premises for your convenience. What safety features or security measures does Provident Crossings Retirement Resort offer to independent living residents? Provident Crossings is a 24/7 professionally staffed community with live in managers and concierge services. For your safety, Provident Crossings is equipped with a medical alert system, all included. If Provident Crossings Retirement Resort accepts dogs or cats, what indoor/outdoor areas can they enjoy? Provident Crossings is a pet friendly community, with no additional fee. Live like you're on vacation at Provident Crossing in an all-inclusive resort! Provident Crossing is the perfect choice for people with a passion for living who are looking for freedom, comfort, independence, security, convenience, and a friendly community in the place they call home. Planned with you in mind, our Apartments are pleasant, beautifully designed living spaces with fully-equipped designer kitchens, luxurious baths, and many smart details to complement your busy lifestyle. The stunning main dining room is the setting for taste-tempting meals prepared each day by our Executive Chef. Plus the best part is its all part of our freedom Dining program that sets us apart from the others. Gracious common areas are ideal for gathering with friends and neighbors. The Walnut Grove theater provides movies and other varied entertainment. Take care of business at the in-house bank, gift shop and beauty salon, or schedule the driver to take you where you need to go. Plus Concierge and valet parking services are at your service! You can even accommodate visiting friends and family in our guest suite. What should caregivers and potential residents know about Provident Crossings Retirement Resort?